The Gaussmeter enables a precise and user-friendly magnet field measurement by means of Hall sensors. 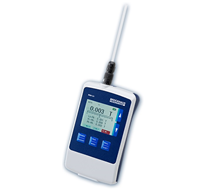 The Operation of the Gaussmeter is via a multicolour touch display and individually programmable display settings. The Gaussmeter is supplied with a LiPo battery pack which ensures long-term operation. The battery pack can be charged either by USB or power adapter. Data transfer is via USB interface thus enabling further data processing of the magnet field measurement on a PC. Special attention has been given to extremely thin and flexible Hall probes which allow magnetic field measurements.